Ah, this makes me way bummed that we couldn't go last night! But looks amazing as always. That's one of my favorite Thanksgiving side dishes. I love it! And what a great story about Chloe. It is cool to see God work in even the small things. What a great story! God cares about EVERYTHING!!!!!! 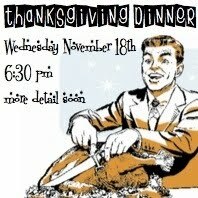 we have yet to get to go to a willow creek thanksgiving dinner...maybe next year! glad everything worked out for cloe! What a sweet story about Cloe. It's amazing how God takes care of all the little details.